Caffia Coffee Group is a family-run coffee machine company offering a wide range of coffee machines for cafes, restaurants, farm shops, office and showrooms – this includes traditional espresso machines and bean-to-cup heavy duty machines as well as the Keurig K150 capsule system for offices. Please view our main website here to see the sheer range of commercial bean-to-cup coffee machines that we offer. We have put together some guiding notes below which may help with selecting a coffee machine. With this task one can easily conclude: ‘I could buy a car for the price of these things!’ With the bewildering variety and significant cost it’s very important to have a detailed understanding of the types, performance and workings of modern speciality coffee machines. Caffia Coffee Group offer the full range from a filter coffee brewer to a heavy-duty bean-to-cup machine and we’d be pleased to work with you. Filter coffee brewers work by percolating hot water over ground coffee of the correct mixture of grinds (finer than cafetiere, coarser than espresso grind) which normally passes through a filter paper into either a glass jug or a thermos flask. The resulting brew is pleasant and thin on ‘body’ (‘thickness’ if you will) due to the fineness of the filter paper; aromatic and very drinkable, filter coffee is very useful for office meetings, hotel breakfast and conferencing. Filter coffee, prepared in batches, is the fastest form of servable coffee – simply pour it and enjoy.. I am delighted to see filter coffee’s popularity make a well-deserved comeback in recent years. Commercial filter coffee machines or ‘brewers’ or ‘pour-overs’ start at the rugged Caffia CX-2 machine with 2 glass jugs and go up to the monster Bravilor B40 with twin 40 litre urns; these latter are known as bulk-brewers – for obvious reasons – and the sheer speed of brew means achieving a delicate and flavoursome brew is quite challenging with these machines. Several companies have made brave efforts – for example the Bravilor Aurora which we have trialled and has quite amazing programing parameters – but still I can’t help thinking smaller batches and slower brew like the classic 3 pint (1.7 litres) that many machines brew is the best option for taste. Cafetieres belong under coffee machines in some ways because having a machine to dispense a carefully measured dose offers an easy and consistent way to make great coffee. You remember the point about a filter coffee machine’s filter paper taking body out of the coffee? With a cafetiere this is not the case and a very enjoyable cup (which still does not have the extraction or punch of espresso or it’s diluted form as an americano) can be enjoyed (or maybe 2 cups). The Bravilor KMD unit is one such doser in service with many hundreds of outlets filling cafetieres quickly and easily. Capsule coffee machines have come about because a filter brewer prepares a whole jug or flask and its tough if you don’t happen to like that coffee! Offering a clever range and making a single cup of fresh coffee, leaf tea or chocolate means this is quality and convenience personified. No surprise then that one of the world’s leading capsule system is KEURIG Green Mountain from the USA and we are pleased to offer superb K-Cup drinks that makes a very generous size mug or cup. A capsule machine tends to be low-priced but the capsules inevitably are a significantly higher cost per cup and also raise questions about wasted packaging – Keurig recently stated the release of a compostable (biodegradable) capsule for the US and Canada. 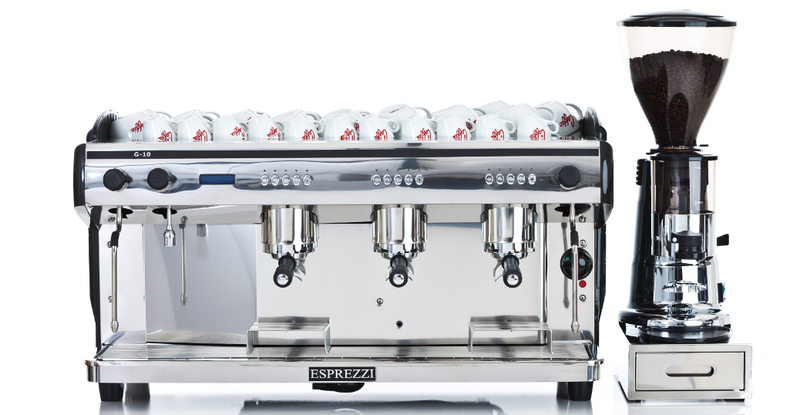 Traditional Espresso Machines – There is one key element across over 150 manufacturers of espresso machines that are out there, and that is pressure. The concept of an espresso machine originated in Italy and the key point is high-pressure extraction of intensely flavoured and concentrated coffee in short measure. This strong brew has spread from Italy to the entire world as a favourite coffee fix – with the Caffia range of beans it comes in a variety of taste styles but should always have a good ‘crema’ – the emulsion of coffee oils that floats on top of the drink (it’s a good idea to stir your espresso to blend this in). saucepan. Once secured in the group head on the machine by means of a quarter of a turn the machine’s pump is triggered to force water through the ground coffee at around 140psi (but low flow rate) and the result is this intense extraction. Milk heating, foaming and texturing are undertaken with the machine’s steam arms – this is a skill that takes practice but don’t worry – we train you on all of this. Strong points of espresso machines are smart looks, good cup warming storage, good ‘theatre’ as customers can see the drink being crafted for them, good prices and robust performance. Also consider that these machines do take time to make a drink as well as skill acquired by practice – also with a human operator (s) there can be a degree of inconsistency in the end product.. it’s fair to say that traditional espresso machines are rare in the office setting as they are not really automated enough to be convenient. Caffia Coffee Group offers a range of both ‘workhorse’ and luxury espresso machines, grinders and barista training which you can see by clicking to our website here. If you run a high-pressure outlet where coffee is not the main focus, have high staff turnover or are in a self-service situation (eg: an office kitchen) you might be better off with an automatic bean-to-cup coffee machine. Bean-to-Cup Coffee Machines are basically automatic robots. With a bean-to-cup you have either FRESH MILK or POWDER MILK integrated into the machine as well as fresh coffee beans. From this combination these machines produce a full range of drinks at the touch of a button like espresso, americano (a diluted espresso), caffe latte, cappuccino and in some cases flat white, mocha (includes chocolate as well as coffee and milk) and espresso macchiato. The automation in bean-to-cup machines is extremely useful in offering a consistent drink and with zero skill on behalf of your staff or in an office or self-service situation maybe by you yourself. A bean-to-cup using fresh milk does produce a better quality drink and the latest generation like the Jura Giga series (above) and Franke A600 are also easier to clean than previously. There are situations where a bean to cup with powder milk and often with hot chocolate powder as well offers a neat ‘vending’ type option that is ideal for offices or showrooms – like the Necta Koro Max for example. It should be noted that in recent years on the one hand, powder milk for touch button bean to cup machines has hugely improved, it is often 100% pure skimmed milk in agglomerated form and on the other hand, the myth that powder milk bean to cups are a lot easier to clean than fresh milk bean to cups is not really credible. Instant Coffee Machines use soluble (instant) ingredients like freeze-dried instant coffee, cappuccino topping powder (around 70% milk) and powder hot chocolate. In a factory or office with a short coffee break these machines can be a real queue buster without breaking the bank but the fact is that generally people are more and more seeking better quality coffee such as a bean-to-cup machine would give. With instant coffee machines, the machine cost is generally lower than espresso machines or bean to cup in some ways with less to go wrong as well. See here for more information. We hope this short intro to coffee machines has been helpful to you, Caffia Coffee Group is a friendly family run company and would be glad to discuss your needs. We have 2 showrooms – one at our Falkirk head office in central Scotland and one in central London; these are very useful for viewing equipment and trying coffees.